The Mass in D Major comes along in two versions: the original with organ accompaniment and the later version with orchestra. It is one of the works which Dvorak composed through the active support and encouragement of a Prague architect, Josef Hlàvka, who was the founder, patron and first president of the Czech Academy of Sciences and Arts. The Mass was not intended for a great public occasion but for the conscration of the private chapel at Hlàvka's castle on his country estate at Luzany on 11 September 1887. Therefore, in its frist version, this Mass had an accompaniment only for organ, the version with orchestra coming five years later. Equally it is a Mass for the Bohemian country Baroque parish churches, so central a feature of every Czech town and village, rather than one requiring the splendour of the ritual in a city cathedral. Dvorak conducted the first performance at the consecration of the chapel and the first concert performance was given in Plzen on 15 April 1888, when the accompaniment was for two harmoniums, violoncello and two double basses. Dvorak's main publisher, Simrock in Berlin, refused the work but Novello's in London, with whom the composer had such a happy relationship, accepted the work on the condition that he provided an orchestrated version as well. 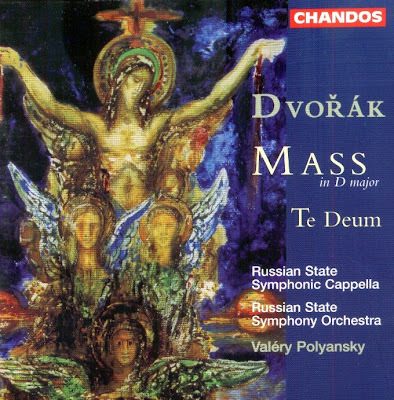 Thus, between 24 March and 15 June 1892, Dvorak completed the orchestration of the Mass in D Major and this version received its first performance at the Crystal Palace. London on 11 March 1893. Dvorak received an invitation to take up the post of Director of the new National Conservatory in New York in 1892. He remained there for three years. Dvorak's arrival was to coincide with the four hundredth anniversary of the discovery of America by Christopher Columbus. For this reason the founder of the new Conservatory asked Dvorak for a work to be performed on 12 October 1892. When Dvorak didn't receive a suitable text for the work from the Conservatory, he decided to chose the text of Te Deum Laudamus that took one month to be composed. Dvorak had a choir of two hundred and fifty in New York when the work was first performed in the New York Music Hall on 21 October 1892. The CD was released by Chandos, 1996 (DDD). CHANDOS CHAN 9505.